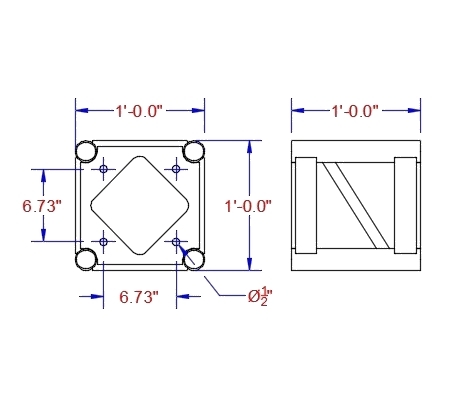 1 Foot Box Truss 12" Silver Aluminum Bolt Connection - SmartStage Corp.
Smartstage 1 foot box truss 12″, silver aluminum, bolt connection is designed and engineered with life dependable welds, to perform to the highest standards. TUV & SGS certified worldwide, load tested and x-rayed for quality assurance. Smartstage box truss and lighting truss comes in multiple sizes from 8 inch (190mm), 12 inch (290mm), 16 inch (400mm), and 20 inch box truss for lighting show performances, and multiple applications. Smartstage lighting truss is easy to install with integral design, simple bolt style connection, comes in multiple lengths from 1′ to 10′, with numerous accessories, wedges, hinges, and corner blocks. Smart trusses are available in many lengths and finishes, curved and angled, with a wide range of connection hardware available. Smart trusses can be configured to fulfill any creative structural concept you design for your event venue or tour. Click to view Load Table. Click to view DWG Drawing. 12″H x 12”W, 1′ long box truss, bolt connection. Generic fit to most standards. Weight: 14 lbs ( 6.35 kg ) approx.